RenŽ Descartes (March 31, 1596 - February 11, 1650), was a French philosopher, mathematician, scientist, and writer who spent most of his adult life in the Dutch Republic. He has been dubbed the "Father of Modern Philosophy," and much of subsequent Western philosophy is a response to his writings, which continue to be studied closely to this day. Descartes frequently sets his views apart from those of his predecessors. In the opening section of the Passions of the Soul, a treatise on the Early Modern version of what are now commonly called emotions, he goes so far as to assert that he will write on his topic "as if no one had written on these matters before". Many elements of his philosophy have precedents in late Aristotelianism, the revived Stoicism of the 16th century, or in earlier philosophers like St. Augustine. In his natural philosophy, he differs from the Schools on two major points: First, he rejects the analysis of corporeal substance into matter and form; second, he rejects any appeal to ends - divine or natural - in explaining natural phenomena. In his theology, he insists on the absolute freedom of GodÕs act of creation. Descartes was a major figure in 17th century continental rationalism, later advocated by Hobbes, Baruch Spinoza and Gottfried Leibniz, and opposed by the empiricist school of thought consisting of Locke, Berkeley, and Hume. Leibniz, Spinoza and Descartes were all well versed in mathematics as well as philosophy, and Descartes and Leibniz contributed greatly to science as well. As the inventor of the Cartesian coordinate system, Descartes founded analytic geometry, the bridge between algebra and geometry, crucial to the discovery of calculus and analysis. His most famous statement is: Cogito ergo sum - I think therefore I am. Descartes is often regarded as the first modern thinker to provide a philosophical framework for the natural sciences as these began to develop. In his Discourse on the Method he attempts to arrive at a fundamental set of principles that one can know as true without any doubt. To achieve this, he employs a method called hyperbolical/metaphysical doubt, sometimes also referred to as methodological skepticism: he rejects any ideas that can be doubted, and then reestablishes them in order to acquire a firm foundation for genuine knowledge. Descartes proceeds to construct a system of knowledge, discarding perception as unreliable and instead admitting only deduction as a method. In the third and fifth Meditation, he offers an ontological proof of a benevolent God (through both the ontological argument and trademark argument). Because God is benevolent, he can have some faith in the account of reality his senses provide him, for God has provided him with a working mind and sensory system and does not desire to deceive him. From this supposition, however, he finally establishes the possibility of acquiring knowledge about the world based on deduction and perception. In terms of epistemology therefore, he can be said to have contributed such ideas as a rigorous conception of foundationalism and the possibility that reason is the only reliable method of attaining knowledge. In Descartes' system, knowledge takes the form of ideas, and philosophical investigation is the contemplation of these ideas. This concept would influence subsequent internalist movements as Descartes' epistemology requires that a connection made by conscious awareness will distinguish knowledge from falsity. As a result of his Cartesian doubt, he viewed rational knowledge as being "incapable of being destroyed" and sought to construct an unshakable ground upon which all other knowledge can be based. The first item of unshakable knowledge that Descartes argues for is the aforementioned cogito, or thinking thing. Descartes was also known for his work in producing the Cartesian Theory of Fallacies. This can be most easily explored using the statement: "This statement is a lie." While it is most commonly referred to as a paradox, the Cartesian Theory of Fallacies states that at any given time a statement can be both true and false simultaneously because of its contradictory nature. The statement is true in its fallacy. Thus, Descartes developed the Cartesian Theory of Fallacies, which greatly influenced the thinking of the time. Many would-be philosophers were trying to develop inexplicable statements of seeming fact, however, this laid rumors of such a proposition impossible. Many philosophers believe that when Descartes formulated his Theory of Fallacies, he intended to be lying, which in and of itself embodies the theory. Descartes suggested that the body works like a machine, that it has the material properties of extension and motion, and that it follows the laws of physics. The mind (or soul), on the other hand, was described as a nonmaterial entity that lacks extension and motion, and does not follow the laws of physics. Descartes argued that only humans have minds, and that the mind interacts with the body at the pineal gland. This form of dualism or duality proposes that the mind controls the body, but that the body can also influence the otherwise rational mind, such as when people act out of passion. Most of the previous accounts of the relationship between mind and body had been uni-directional. Descartes suggested that the pineal gland is "the seat of the soul" for several reasons. First, the soul is unitary, and unlike many areas of the brain the pineal gland appeared to be unitary (though subsequent microscopic inspection has revealed it is formed of two hemispheres). Second, Descartes observed that the pineal gland was located near the ventricles. He believed the animal spirits of the ventricles acted through the nerves to control the body, and that the pineal gland influenced this process. Finally, Descartes incorrectly believed that only humans have pineal glands, just as, in his view, only humans have minds. This led him to the belief that animals cannot feel pain, and Descartes' practice of vivisection (the dissection of live animals) became widely used throughout Europe until the Enlightenment. 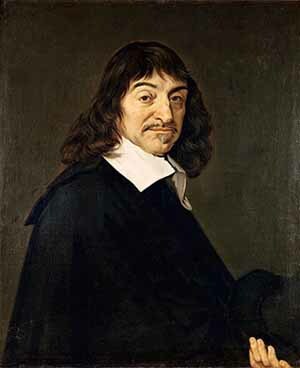 Cartesian dualism set the agenda for philosophical discussion of the mind-body problem for many years after Descartes' death. The question of how a nonmaterial mind could influence a material body, without invoking supernatural explanations, remains controversial to this day.